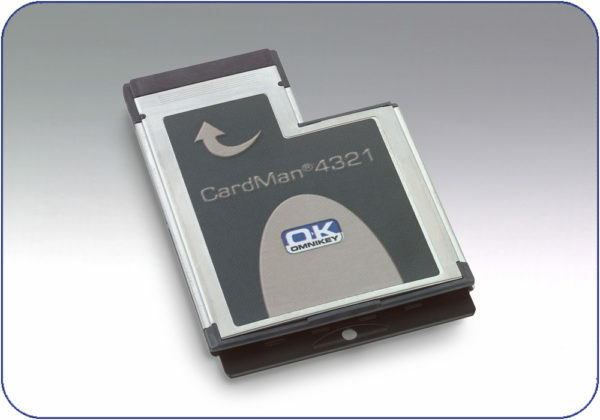 The Omnikey 4321 is one of the first ExpressCard™ smart card readers available on the market. The new interface standard, designed to enable smaller and faster PC card solutions for next generation PCs, has already been implemented in the latest laptops in addition to or as a replacement for traditional PC Card expansion slots. Whatever the requirement of the mobile contact smart card-based security application, OMNIKEY’s new high-speed ExpressCard™ reader can support it. The Omnikey 4321 uses the USB 2.0 interface as defined by the ExpressCard™ standard for simple integration within a mobile device. Due to its small size, it is also ideal for mass distribution by mail, bundled in an envelope or small package together with accompanying smart cards and/or software. with PC: 12 Mbps (USB 2.0 Full Speed). T=0, T=1, 2-wire: SLE4432, SLE4442 (S=10), 3-wire: SLE4418, SLE4428 (S=9), I2C (S=8), SLE 4404. Supports 5V, 3V and 1,8V Smart Cards. Windows XP64bit (IA64, AMD64, EM64T).